A team of weavers hard at work. 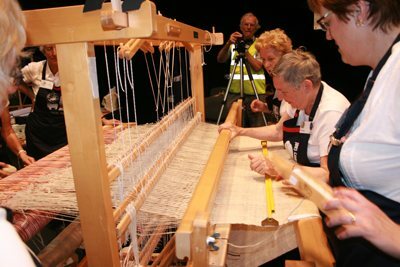 The cloth was woven on two looms, this one is the larger of the two: a Varpapuu Finlandia 8-shaft countermarch loom with a 50" width. Photo by Dennis Walker. I dnt know yet. I am portuguese 80 years old. Keep calm..,..